2-day excursion along Cusco city & The Sacred Valley of the inkas. Raul is simply the best. His knowledge Of the Peruvian culture and history is extraordinary, in-depth and very informative and prospective is second to none. If you are looking for off the beaten path and secret spots look no further. Touring Cusco with Raul was an incredible experience. I have never met a tour guide that had so much knowledge and passion about history, especially regarding the Andean region. He is a local that deeply understands the culture and sees history from a very objective perspective, rather than what the history books teach us. If you are ever in Cusco do not think twice about doing a tour with Raul. Raul exceeded expectations as a guide. His knowledge, attentiveness and charming demeanor made for the perfect tour. Highly recommended! It was like having a education comprising of history biology and culture all in one. Our time with Raul left us with great knowledge and excellent memories. We would strongly recommend him if you want in depth knowledge of the city and area. Very accomodating to our schedule. The driver he had was also very good, van clean and spacious. 10 out of 10. Book him!! Raul is extremely knowledible and engaging. We thoroughly enjoy our tour with him of the valley south of Cusco and highly recommend him. We would like to thank Raul for the absolutely wonderful guide service that he provided for us for the four days were at Cusco and Machupicchu. His knowledge of the Inca culture and evident passion for Peru and its history made our tour amazing. The transportation and the drivers were first class and when Raul had to leave us for one day because of medical reasons his back up guide Walter also provided excellent service. We visited all the major Inca sites. Thanks so much Raul. Raul is an excellent tour guide and very knowledgeable about the history of the region. He helped us plan the tour to suit our time constraints and our physical limitations. We enjoyed the day and came away with a good understanding of the Inca period. Tour delivered as negotiated originally. Everything went smoothly, and as planned. Raul was an excellent guide, but only able to remain with us for the first days. His replacement, Jhon, was absolutely excellent too. The vehicles in which we travelled were comfortable and in good condition. All scheduled time appointments were kept without any failures. The knowledge of the guides was thorough and each carried a useful notebook with reference material that helped respond to questions we had. This was a great tour! Raul is very knowledgeable and provided insight that would not have been available on a large commercial tour. We learned a lot about Cusco, the Incan people and Andean life. Great tour, great guide! We cannot recommend Raul enough. His tour was very educational, entertaining, and greatly enjoyed by the whole family. Raul was very knowledgeable about many diverse subjects related to the region including culture (past and present) architecture, astronomy, history, archaeologolgy, politics, food and more. Any question we asked he was able to answer and elaborate on. His selection of sites to visit was perfect and we all learned many new and interesting things throughout our day with him. TOUR GUIDE RESPONSE: Hi Mr. Murphy, Thank you for your feedback! I so happy to serve clients like you and hope you have a memorable time in our land Perú!!! All the best!!! YOUR LOCAL GUIDE RAUL C.H. Raul is awesome! Of the many guides we have known over the years, Raul stands out as the best ever. A true expert in all areas of Pervuan culture and history. A full day visiting Cusco and surrounding areas with Raul did not come close to scratching the surface of his knowledge. Raul, I'm sure you will understand when I say that we dream about ceri mayos!! Thank you for sharing both your knowledge and you passion for and love of Peru. Raul provides a fantastic tour! He is exceptionally knowledgeable on a wide variety of topics...from astronomy, organic farming, Inka culture, natural medicines and more. He was also great in scheduling our tours...keeping us free of large crushes of tourists. But he is also highly flexible and happy to adjust a tour based on your interests and restrictions. Raul is very personable. He is also very dedicated. I can't recommend him highly enough. You will have a great tour if Raul is your guide. Raul was an extremely knowledgeable guide. We enjoyed learning about the Andean aspects of the artwork in the cathedral, tasting new fruit at the market and learning about the amazing architectural techniques used by the Inca. Raul made our visit to Cusco memorable. He is knowledgeable on a wide range of subjects from local culture, history, to agriculture, music and food. His tour was quite flexible and made adjustments to the published itinerary once learning our interests. One very memorable moment came on our visit to Moray, where halfway down into the terraces he took out his flute and played a mesmerizing folk tune. You could see how all visitors in the area stopped to listen to him. He's a wonderfully personable guide! amazing guide! he show us the best views and the all history about the places visited. the best tour in Peru! TOUR GUIDE RESPONSE: Hi dear Friends! Thank you for your review! I hope you like the Cd with my music and you can remember your good times in Peru!!! Having Raul for our guide was the highlight of the trip! He brought the history of the Incas to life. His knowledge of the Inca's spiritual, architectural and astronomical was incomparable! We loved Peru; the food, chocolate, and empanadas, the mountains, valleys and rivers, and especially the Peruvian people! Raul exceeded expectations as he was very knowledgeable and enthusiastic. I cannot imagine going to Cusco without his expertise. I cannot overemphasize how important he was to making our trip the outstanding experience that it was. If you can afford to go to Cusco, you must not scrimp on the guide service. You must hire Raul. The whole day was a real pleasure. Raul is a perfect, very experienced, patient guide, who knows more than we ever imagined about places, history, astronomy, plants, food, agriculture, ancient culture - it was very informative. We asked Raul to change the program slightly and everything was possible. The sacred valley was blooming, we were overwhelmed by its beauty. Raul is head to toe full of knowledge, love, and respect for his country and all it entails. If you want to be immersed in the culture and get to know the facts alongside the spiritual elements of many sites, Raul is the guide to hire! He and his family staff help to make everything flawless and I was totally, completely taken care of the moment I arrived in Cusco. They thought of everything to make my time as easy and fulfilling as possible. Great guy, you'll be sure to learn lots!! We had a fantastic walking tour of Cusco with Raul. Raul overwhelmed us, sharing both his knowledge and life experience of this region and it's history. We especially enjoyed our time with him in the Church in San Blas,and the San Pedro Market. Fun and informative! We enjoyed our tour with Raul. He took note of our interests and tailored the tour accordingly. The visit to the food market on Sunday was really enjoyable. Wow! I have been around the world and have had many guides -- and I can honestly say that Raul has been the most amazing guide ever! He is super knowledgeable, not just about the basics of Inca culture but about local life and insider aspects of that area. We spend 3 hours in the local market where he introduced us to so many amazing experiences that we never experienced in other markets across the world. We left Peru not only so more educated, but also with a great friend! Grab Raul if he is available! Raul was really terrific! He is extremely knowledgeable about history, geography, economics, and geology, and his English is extremely good. He planned a great itinerary for us and was very attentive to keeping on schedule. Machu Picchu is REMARKABLE! Wow, wow, wow. That is all I can say about Raul. He was so wonderful. We love to use Tours By Locals when we travel and Raul is just the reason why. He took us all through Sacred Valley and was so knowledgeable and kind. We saw ruins, went shopping and ate at an amazing buffet. I would highly recommend Raul!!! TOUR GUIDE RESPONSE: Hello Mary Ann, I'm fee so well to read your review! It's great! Thank you so much. I give my best efforts because it's my passion! Keep traveling! RAUL!!! Raul did a great job. We loved his passion for the sties. He is incredibly experienced and handled us perfectly. TOUR GUIDE RESPONSE: Dear Jim, Thank you for booking with us! I'm sure you have a great tour package and good memories! Thanks to your family as well! Maybe your son & sisters will be back in the future! Your friend, RAUL C.H. Raul was the X factor that made an amazing trip to Peru an emotional and psychological adventure. He is a gentle man whose passion and pride for his Incan heritage is only matched by the depth of knowledge that he has acquired over the years. It was like an experiential undergraduate course on Peruvian/Incan culture. At the same time, he was very sensitive to the fact that it was our experience and knew exactly when to let us just take it in. Also, an accomplished musician. Highly recommended! Raul is amazing, his enthusiasm is infectious and our Sacred Valley Tour was fantastic. He obviously loves his job and is very honest and open to the many questions we had for him. The whole day was great and i would highly recommend this tour. We saw 3 sites and spent some time at each and felt like we had a pretty good understanding of the Inca history afterwards. Great to do this tour before Machu Picchu visit. TOUR GUIDE RESPONSE: Dear Yasmine, What you say it's really amazing: "his enthusiasm is infectiuos" I'm proud of it and thanks for your feedback and visit Peru! Always, RAUL C.H. Raul is an amazing man. Raul has a very deep knowledge about the Andean (Inca) culture. He has extreme expertise in natural medicines, botany, ancient and present day cultures, music, astrology, gastronomy and many other things. Raul is very professional, kind, friendly, fun, patient and an honest man. Raul has a wonderful work ethic. He was always on time. We never felt rushed. He is also a wonderful musician. We immediately felt like he was our friend. He is a superb guide! We highly recommend him. TOUR GUIDE RESPONSE: Hello dear Sydney, Thank you so much for your feedback! A blessed 2014 to you and family. Your local guide in Peru! Raul C.H. 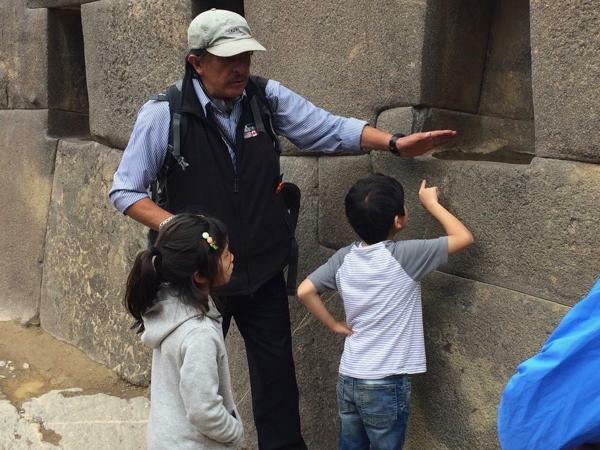 Raul is a delight to tour with, extremely knowledgeable about the Cusco area, and comes prepared with a backpack full of visual aids to help explain the Inca ruins. You will be delighted with his company. Did a wonderful tour for my family. He was very knowledgeable and kept everything moving at a great pace. What a wonderful experience! What an amazing tour! Raul took us to so many interesting places (llama farm, weaving workshop, silver shop, local markets, local lunch) as well as our planned visit to several cities in the Sacred Valley. He is a true professional and has so much knowledge about his country and its history. He seems to love Peru and also helped us to fall in love with this beautiful country. This was definitely one of the highlights of our trip, and I would recommend Raul to all travelers! Raul customized an excellent day for our family of 7, consisting of grandparents to 1-year-old. The tour was paced perfectly for our energy and interests. He was well-prepared with documents, props and hands-on demonstrations to engage the kids and illustrate the beauty of the Sacred Valley and it's people. I highly recommend this guide. TOUR GUIDE RESPONSE: Hello Lesli, I'm very happy to check your review!!! Thanks one again for your visit!!! Raul!!! A good tour guide needs to love his country, be a wonderful story teller, have an enormous knowledge about local culture and history, be intuitive about people and their interests and leave people wanting more. Raul C did this many times over. We have never had a guide that was more able to share in the richness of their country. It was both a pleasure and an honor to have him as our guide. Future trips to any part of this beautiful country will always include him! TOUR GUIDE RESPONSE: Wow!!! Thanks for your review dear Debi!!! I aprecciate it a lot!!! RAUL!!! TOUR GUIDE RESPONSE: Thanks Amalia for the 5 thumbs up!!! Raul is simply a great tour guide! The best we have ever had. Great subject knowledge, honest, spiritual, and really cares about his clients. TOUR GUIDE RESPONSE: Hello Amalia, Wow!! !thank you so much for your beautiful review!!! Greetings from Cusco!!! Raul was really wonderful. He picked us up at the airport and took us on a one day tour in the sacred valley. It was the highlight of our 2 week trip. He is very knowledgeable,enthusiastic,spoke good English and worked very hard to be sure the itinerary we requested was accomplished in a comfortable fashion and a nice pace. He succeeded in all respects. I would hire him again in a minute and highly recommend him. Raul was kind enough to handle a non-standard route for our all-day tour of the Sacred Valley (we were starting at one city and ending at another). He met us right on time and led us through a great day of sights, food, experience and learning. Raul knows so much about the Sacred Valley, the people and the history, and spoke with great passion. We felt very lucky to have had him guide us around, We highly recommend any tour with Raul. We had a wonderful time touring the Sacred Valley, Cusco, and Macchu Picchu with Raul! He is attentive, knowledgable, and funny. The trip was well-coordinated and we didn't have to worry about a thing - he arranged everything, hotels, airport transfers, the works. I will recommend him to anyone I know coming to Peru. Very informative and punctual, we enjoyed being contacted before the tour, we have received information that made the tour very pleasant as what clothing we needed to prepare us for a great day. We had a wonderful day with Raul. We toured the Temple of the Sun where Raul was very knowledgeable about the property. We also visited the Sacred Valley, a local market, silver shop, an animal sanctuary and a textile demonstration. We had a delicious lunch at a true local restaurant and enjoyed chatting about how he came to have such fabulous English speaking skills. We never felt rushed and Raul was able to set a good pace and detail level for our kids, ages 10, 12, and 14. We would recommend Raul.